Spring blooming bulbs in Madison, WI on March 21, 2012 3-4 weeks earlier than normal. The calendar indicates spring begins on the vernal equinox, March 20. Last year spring was here by then, with many early spring-blooming bulbs such as crocuses, winter aconites, and snowdrops already done blooming and the daffodils out in full force. This year, with all the snow blanketing the ground, it seems unlikely that spring will ever get here. In Wisconsin there is no such thing as a “normal” weather year. There are usually extremes during at least one season out of every year. It is for this reason that the solar calendar is often not the most accurate indicator of natural events. Because many factors such as latitude, altitude, and the buffering effects of large bodies of water affect climatic conditions, regional differences occur in all biological events. Because of the wide range of variability in climate, scientists look elsewhere to predict natural events. This area of science is called phenology. 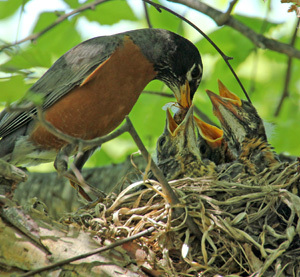 Robin feeding its young with insects. Phenology can be defined as the timing of natural living processes with weather events. The return of various migratory songbirds, the blooming of wildflowers and woody landscape plants, and the development of local populations of insects are all examples of phenological events which are easily observed each spring in any location. Phenology observes the relationship between 1) discrete natural events, 2) events and the season, 3) events and local weather conditions, and 4) events and climatic changes. Records of such natural events over a period of several years are helpful in determining climatic changes as well as any shifts in native plant or animal populations. Until the early 1900’s, phenology was frequently used to predict when certain life events were expected to occur. The father of plant taxonomy, Carl Linnaeus, was one of the first people to begin recording phenological observations. In Wisconsin, Increase A. Lapham and Aldo Leopold kept detailed records of natural events. Common lilac (Syringa vulgaris) blooming. In 1959, a number of people with a common interest in phenology met in Madison to discuss ways of systematically collecting phenological data. It was from this interest that the Wisconsin Phenological Society was born. The first meeting of this new society was held in January 1961. The initial response to the membership drive was outstanding. During the early years, membership was consistently above 500. Some of the early activities of the Wisconsin Phenological Society include the observation of phenological events on the common lilac, emergence of promethea silkmoth (Callosamia promethea), and the freezing and thawing dates of Wisconsin lakes. 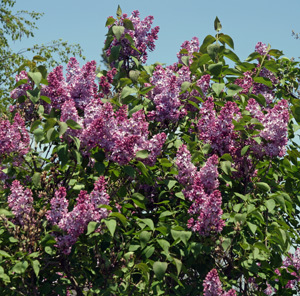 On a larger scale, Wisconsin phenological observers participated in the lilac plant survey in the northeastern United States. 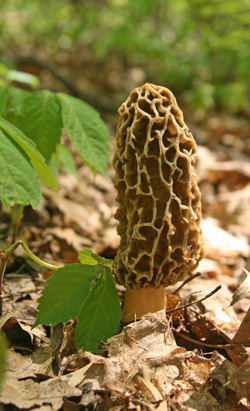 Morel mushroom in the woods. Some common events gardening phenologists keep track of are the dates of the first and last frosts, when the ground freezes and thaws, the best time to hunt morel mushrooms, the planting and blooming of herbaceous and woody landscape plants and the emergence of insect pests. I’m sure you’ve heard the saying “plant corn when oak leaves are the size of a squirrel’s ear”. We all know that planting corn has nothing to do with oak leaves or squirrel’s ears, but over time farmers have learned that when oak leaves have reached this size, the soil is warm enough for corn seed to germinate without rotting in the soil. This holds true for all warm-season annual plants. 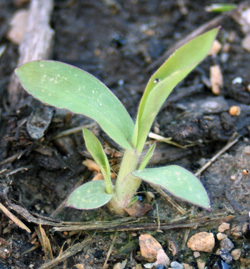 Crabgrass, the bane of many gardeners, germinates when the soil temperature at 4″ stabilizes at 55°F. Although it is difficult to correlate soil activities with ambient temperature, this soil temperature correlates roughly with when the common lilac is in the early bloom stage. This is important to know if you plan to apply an herbicide to prevent crabgrass seed from germinating. Too early or late an application will miss the window of opportunity and you’re left with only mechanical tools (cultivation) with which to control this weed. 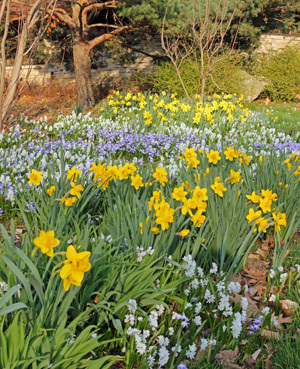 In some years, weather patterns put spring into a state of suspended animation, with spring-flowering bulbs putting on a spectacular show for weeks. But in other years spring seems non-existent with bulbs and wildflowers rushing through bloom because of warmer than normal temperatures. Wisconsin, and much of the country, also suffered through drought and warmer than normal temperatures this past summer, causing many garden plants to experience from something we don’t often see in Wisconsin – heat stress. 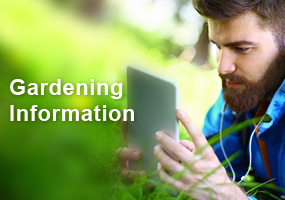 Another area where phenology is useful in gardening is in the prediction of insect pest problems. Because insects are cold-blooded, their growth and development is directly correlated with weather conditions, particularly temperature. Plant-feeding insects have evolved closely with their host plants and therefore there is a similar developmental period between the two. By monitoring plant development, which is characterized by distinct life stages, you can also monitor insect development. 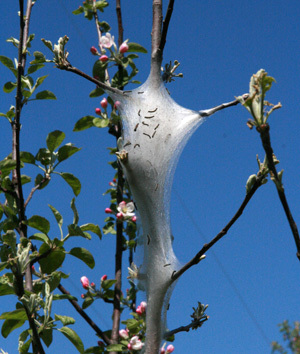 For example, Eastern tent caterpillar (Malacosoma americanum) egg hatch coincides with bud break on flowering crabapple and wild plum – their most common host plants. Looking for, and controlling, tent caterpillars at this early stage is much more successful than waiting until they have defoliated your plant. Allergy sufferers will also find phenology useful. 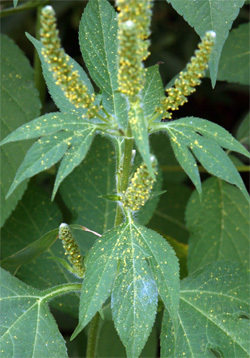 Allergies to plant pollen are often seasonal. Exact times of allergic reactions will vary depending on the weather and the rate of development of the offending plant. 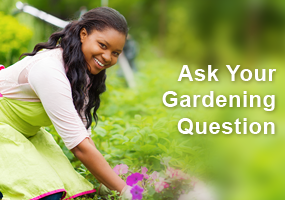 Trees typically pollinate in May while grasses are troublesome in June. Ragweed (Ambrosia spp.) typically doesn’t become a problem until August. But in a warm year, blooming may occur earlier than the norm so that sneezing and itching eyes starts earlier too. Phenology can be more than just a hobby for gardeners, it can become a way of connecting better with nature. For centuries farmers have relied on the signs of the seasons to help them grow a crop. 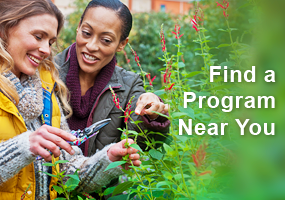 You too can use phenology to develop your own calendar and grow a beautiful garden. Observers are very important to the continued collection of phenological data. If you’re serious about becoming a phenological observer, the Wisconsin Phenological Society and USA National Phenology Network offer advice to help you with your observations, and ways to contribute to larger collections of data. Always an interesting subject I always learn something new.